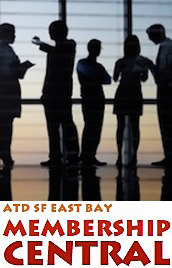 ATD SF East Bay - SAN RAMON | "Going Mobile: Big Growth Ahead?" SAN RAMON | "Going Mobile: Big Growth Ahead?" "Going Mobile: Big Growth Ahead?" Whether you are beginning your journey, or have implemented m-learning in your organization, you need to tune into this topic. M-Learning is expected to year-over-year growth of 15% between now and 2019. That means a lot more L&D resources will be moving in that direction. So, we need to stay on top of it. Join us for a highly interactive and engaging panel discussion on M-Learning. We'll have some topics to kick it off, but through a facilitated interactions the addendees will drive the agenda to a high degree. This is your meeting, so bring questions. Steve joined the Bersin & Associates team in April 2010 and is responsible for business development and member relations for the west coast of the U.S. and Canada. Steve has over 25 years of Solution Selling and Sales Leadership experience, including 15+ yearsof Talent Management industry background working with Administaff and Gevity HR in the area of HR Outsourcing and with Development Dimensions International in the areas of Learning and Development, Talet Acquisition, and Succession Management.Steve Manages the overall relationship between his research Members and Bersin by Deloitte. Jamila manages a team of learning professionals, instructional designers and media developers in the design of digital learning products within KP's Learning Solutions national team, and has been working with multimedia, learning design and technology, and the web, since early in her career. She is passionate about visual and interaction design, user experience, and the art of instruction, for our rapidly evolving learning ecosystem at Kaiser Permanente. Jami understands the current learning ecosystem well. She is very interested in mobile learning, and has been chairing an enterprise mobile learning group taking a mobile first approach to learning content, exploring the many different ways we can learn just in time, flexibly. Jami has a strong design and communications background, with over 20 years of industry experience. She has a BA in English and Art from Whitman College, and has completed post-graduate studies in illustration at California State University, Long Beach. Outside of work, Jami loves travel, animation, and the outdoors, and stays very happily busy with her two boys.